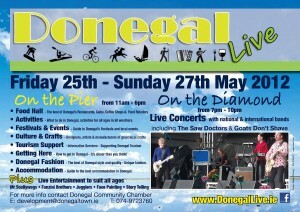 Donegal Live 2012 will be held this year in Donegal Town, Co Donegal. A spectacular three day event in May will feature live open air concerts in The Diamond and a major exhibition area highlighting the best that Donegal has to offer in the the categories below. Donegal Town Community Chamber in association with Fáilte Ireland, Donegal Tourism and the Donegal Association are proud to have been selected to host this Major Tourism promotional event, which took place in Dublin’s Temple Bar, The Iveagh Gardens and Glasgow over the last two years and which highlighted all that County Donegal has to offer tourists from both home and abroad. 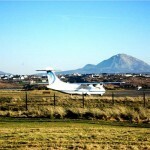 Donegal Town will be transformed into a Tourism exhibition centre, with Live Music Concerts from National and International Bands on the Diamond area. Our tented village on the Pier will house exhibitors showcasing all that the county has to offer the discerning visitor. Looking Forward to seeing you there.